When we host Halloween themed gatherings at our house during October, I do Halloween MY way. With burlap and some spooky food, Halloween is all about fun and friends and not about necessarily scaring me to death! The first step of throwing a Halloween party is preparing food and placing it out for the party! I always make food that is easy to cook in bulk. 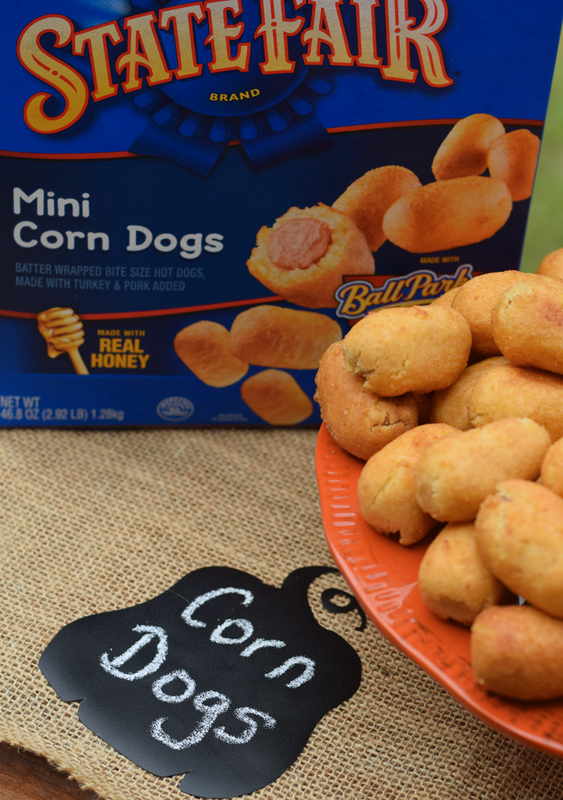 Tyson® Chicken Nuggets and State Fair® Mini Corn Dogs are an excellent solution when entertaining a crowd. They are both easy to make, leaving me more time to spend with my guests and less time in the kitchen. 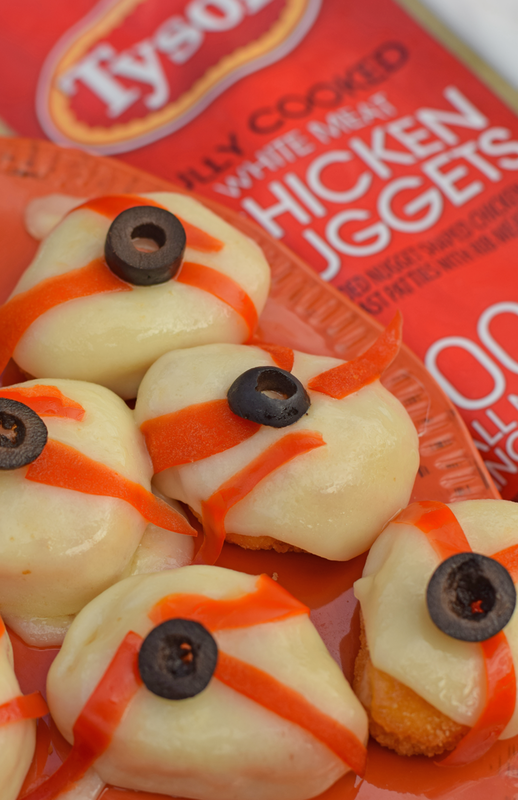 Do you want to make your Tyson® Chicken Nuggets a little on the spooky side? Add a few ingredients and they become Bloodshot Eyes! Using a potato skin peeler, peel the skin from a washed red pepper. If needed, cut it thinly into smaller strips. 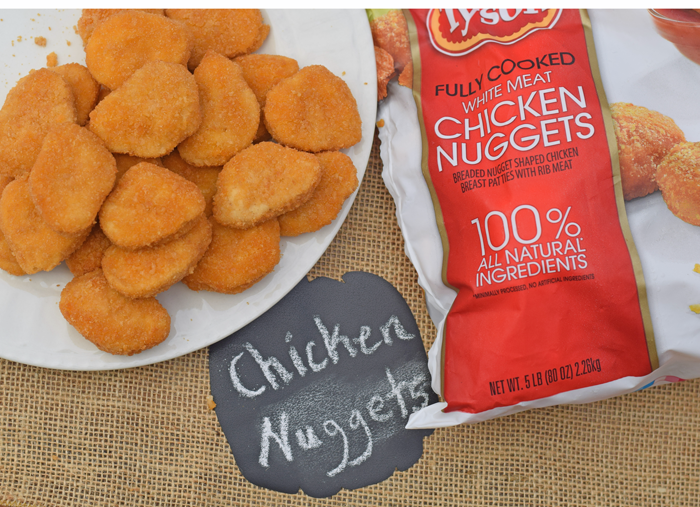 While the Tyson® Chicken Nuggets are still hot, place a piece of provolone cheese on the nugget so that it melts. If you think the cheese piece is too large, you can cut it in half, as long as it still covers the Tyson® Chicken Nugget completely. Place the red pepper strips across the cheese, pressing them slightly into the cheese so that they stick. Place a black olive piece in the center. 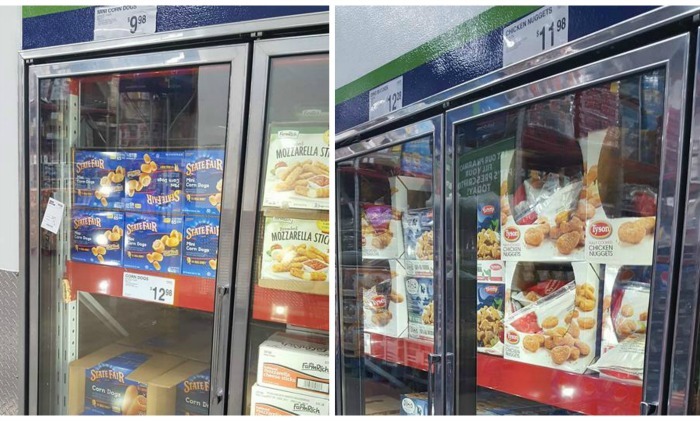 I buy both Tyson® Chicken Nuggets and State Fair® Mini Corn Dogs at my local Sam’s Club. 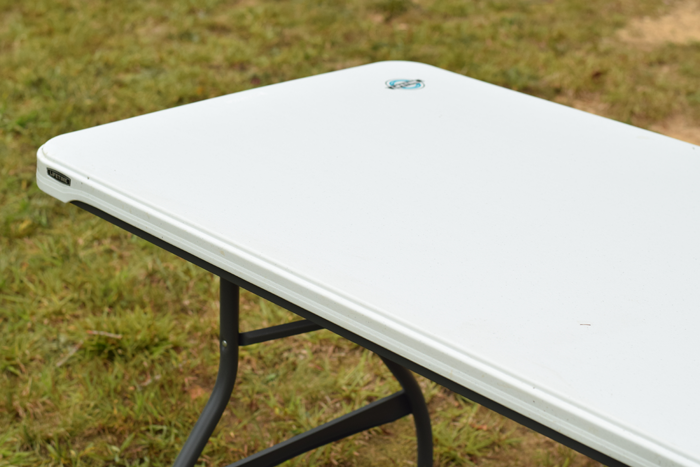 Psst….that’s also where I purchased the table in the photo below for entertaining. 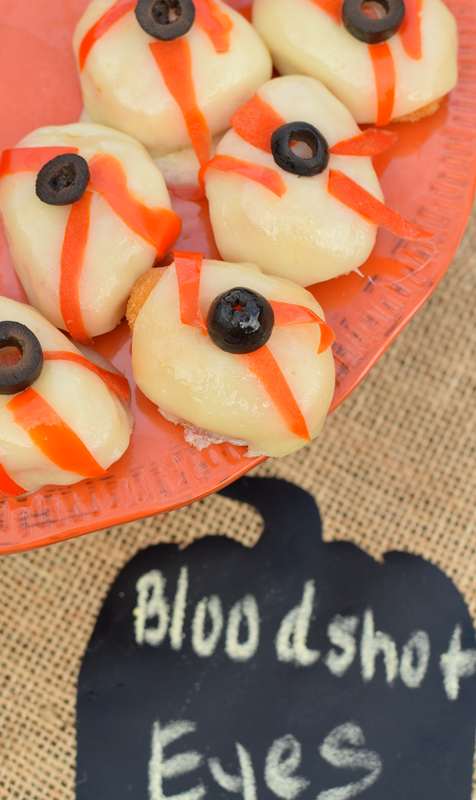 You can find more Halloween party inspiration here! Now for the burlap table runner. Why does Halloween have to be spooky? In my opinion, Halloween decor should be pretty and full of burlap and cute pumpkins. If there’s one place that I won’t be found during Halloween, it’s at a spook trail or haunted house. I’ll leave those things for the souls braver than me. Creating with burlap can be intimidating at first. Have you ever tried to cut the stuff? It’s like the fibers explode! 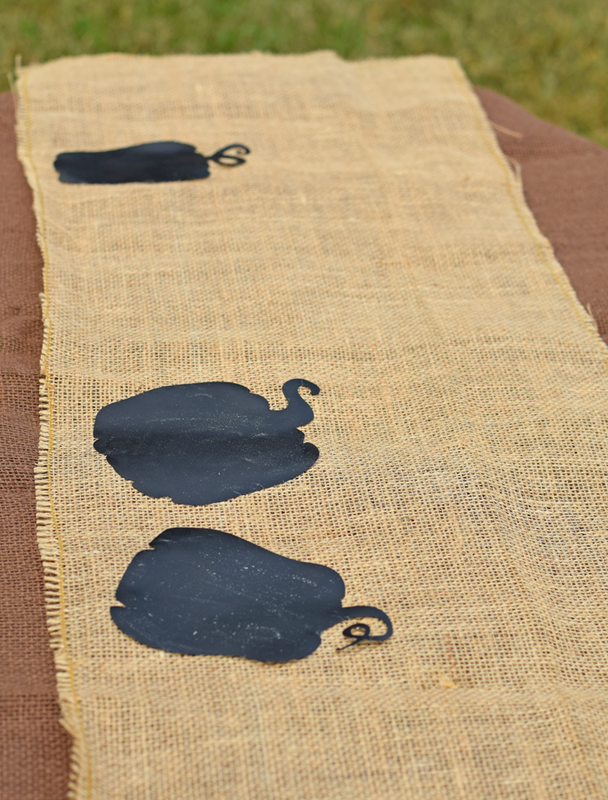 But with a few tips and tricks, making a burlap table runner for a Halloween themed party is easy. This one includes chalkboard pumpkins. By using chalkboard vinyl, we can make a table runner that allows for us to write on the vinyl what each dish is. 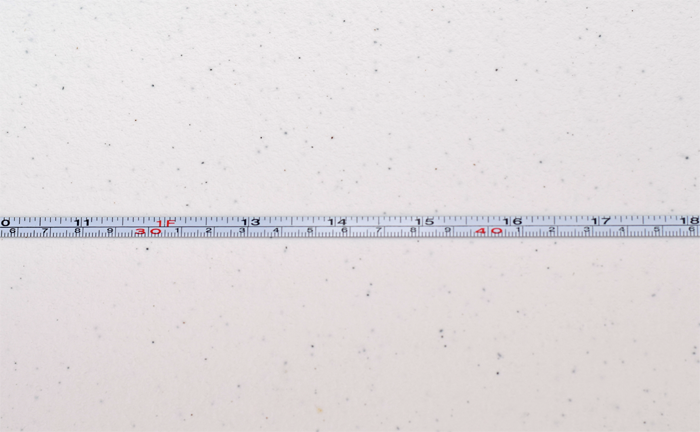 Begin by measuring your table with the tape measure. Add two feet to the length of the table. For the width, a table runner is generally supposed to be approximately 1/3 of the table, but when in doubt I just make it around 12″ wide. Cut the burlap the size of the measurements. 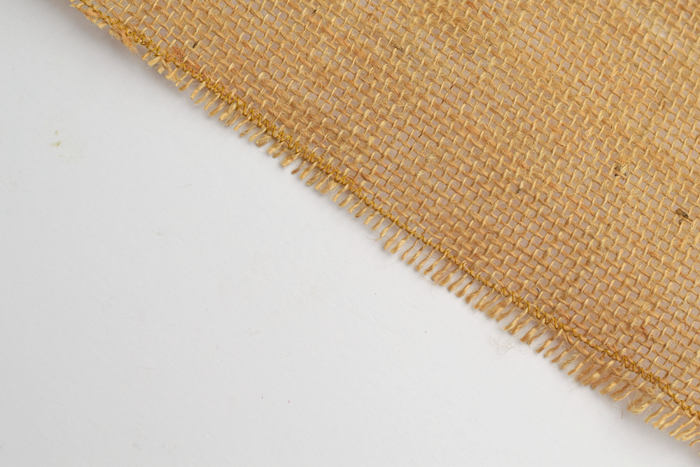 Sew a zigzag stitch around the edges of the burlap. Stitch as closely to the edges as possible. After sewing, trim up any uneven pieces, being sure to not cut through the thread. 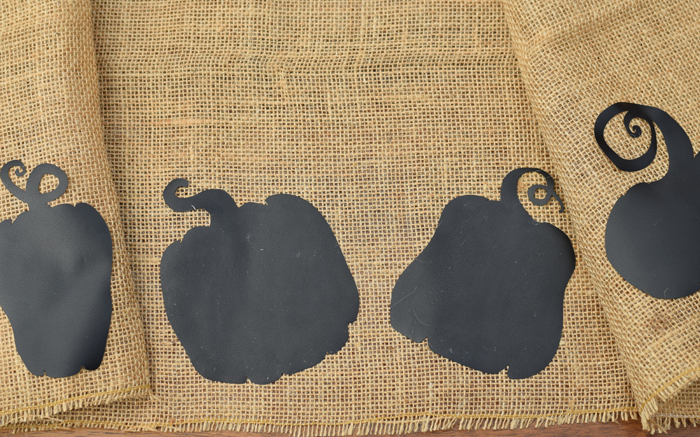 Now cut the pumpkins from the chalkboard vinyl. 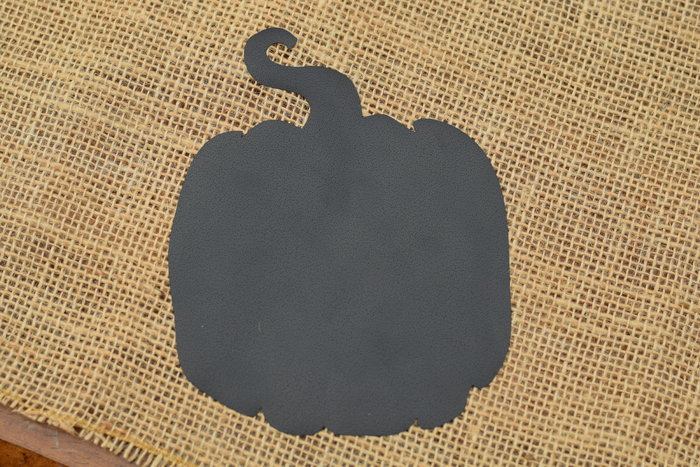 If you’re using the Cricut Explore Air and the Cricut Design Space software, there are pumpkin stencils that are already designed and ready to cut. 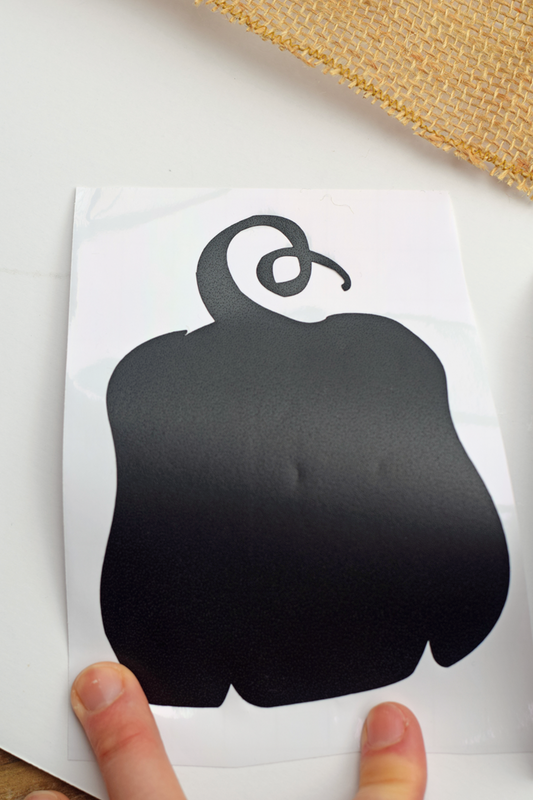 If you do not have a die cutting machine, you can free hand pumpkin shapes, use a purchased stencil, or a pumpkin shape from another project to make the vinyl cut outs. I cut these pumpkins at approximately 5″ (this includes the stem). 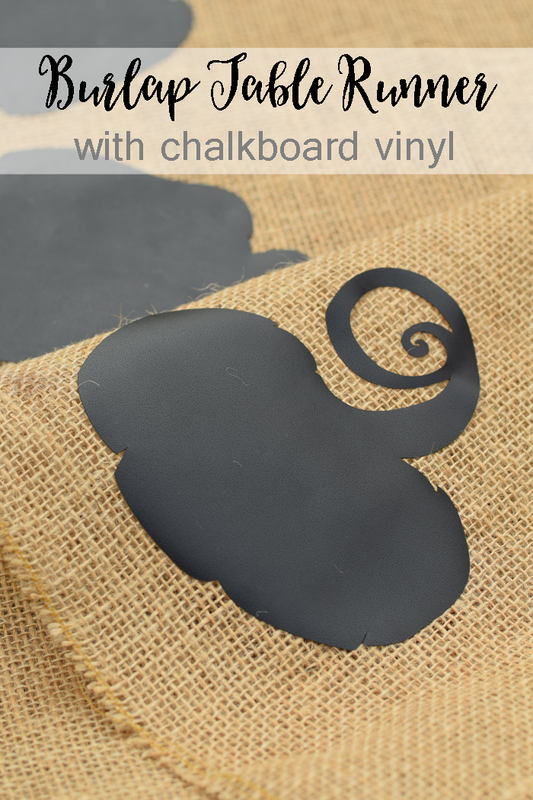 Adhere the chalkboard elements to the burlap in designated places. You can place them as close together or as far apart as you like. The burlap is not very “sticky,” making them easy to remove and place somewhere else. How will you make your Halloween gatherings uniquely yours? 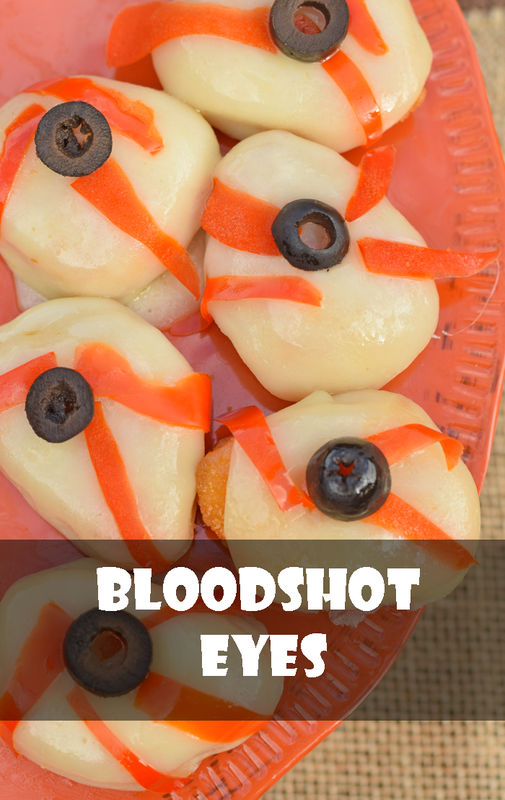 I love this idea and the bloodshot nuggets are awesome! I love fixing fun halloween food in October. This is such a cute idea. I LOVE the table runner too! Such fun and festive ideas! The table runner is so cute! And those eyes are the best spooky snack idea! Eek those bloodshot eyes are perfectly spooky for Halloween! 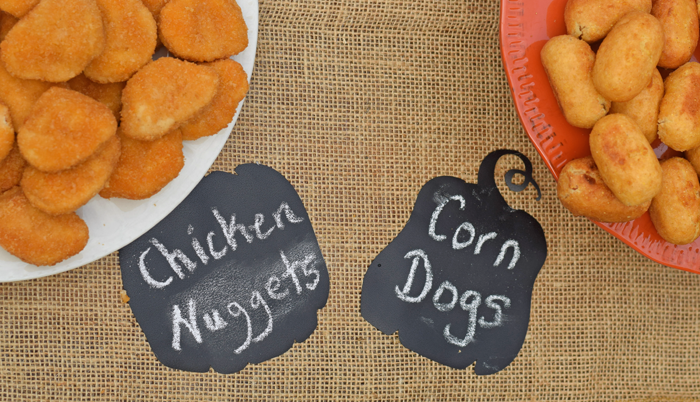 Not only is the table runner adorable but the snacks are exactly what my kids would love to eat a party! Cute!!! Such a cute idea for Halloween. Very clever! You have some fun ideas for festive food. It is still looks good enough to eat, but has that Halloween factor for sure. Those eyes are just all types of creepy fun! What a cool thing to do this month. 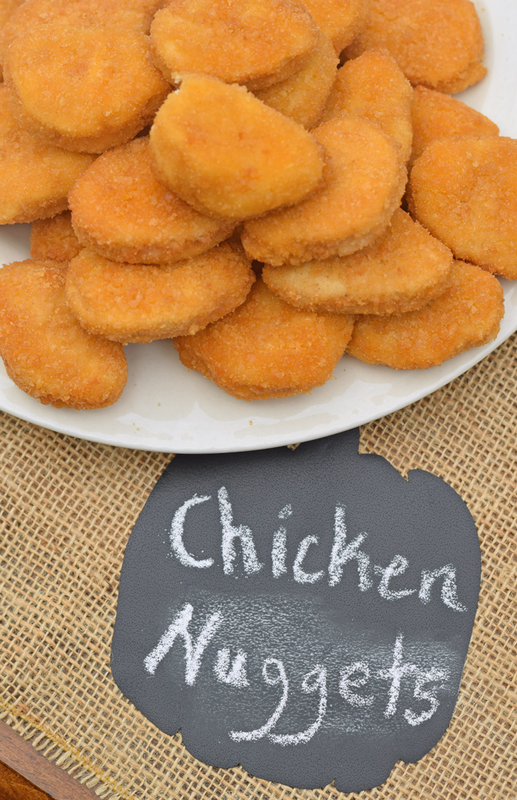 The chicken nuggets are awesome! I could see them being a hit at a kids’ Halloween party.